I had the pleasure of attending my first coffee cupping today. The cupping was hosted by Counter Culture Coffee at their brand new traning/education loft at Atlanta’s King Plow Art Center. A BIG thanks to David and Chris of CCC. They guided the process with eloquence and passion. It was informative, memorable and a bit surprising (ask me about the suspenseful "twist" at the conclusion). This photo is of their new Clover 1s. This machine is generating a lot of "buzz" in the coffee industry. 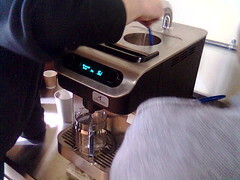 It is designed to allow a barista to micro-brew coffee a cup at a time. This allows for the preperation of different types of coffee to different customers rather than having big pots of just a few (or two) varieties. So a shop could offer a customer a cup of coffee VERY specific to his/her tastes (region-specific, roast-specific, etc.). With luck, it’ll help elevate the level of coffee served way beyond the typical "regular or decaf" options. With it, you can have a cup of Costa Rican Terrazu and then follow up with a cup of the Sumatra Aceh French Roast.